Michael J. Cronin, 81, of Colts Neck passed away on November 2, 2018 at Riverview Medical Center in Red Bank. Michael was born in Jersey City to the late Joseph and Regina (Meehan) Cronin and grew up in Keansburg where he ran the waterboat ride at Keansburg Amusement Park and earned enough money to purchase his first car and at age 12 began his long and illustrious career of paying as little tax as was legally allowed. After his family finally settled in Middletown he attended Red Bank Catholic High School. 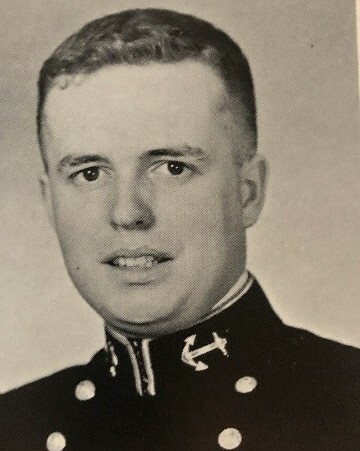 Graduating from RBC in 1955, he was appointed to the United States Naval Academy (USNA) Class of ‘59. In his yearbook it said of him “Mike characterized the great Irish spirit so typical of his race… …He read a great deal, but this never interfered with his being a star man… …On summer cruise, Mike was continuously fascinated by the strange lands which he visited. He proved an interesting companion to have along… …what with his Gaelic charm. Mike loved USNA as only he could and his years here were happy ones”. GO NAVY BEAT ARMY. Upon graduating from the USNA, Michael was commissioned into the United States Army and stationed in West Germany to defend Europe from the Soviet menace, but not before appearing on the national television show “I’ve Got a Secret” in July of 1959. With his military service complete Michael returned to the United States and earned his Doctor of Jurisprudence degree from Harvard University. Michael then entered the commercial world as an attorney with his first position culminating as Director of Licensing at ITT where he defended Raggedy Ann and Andy, RC Cola and others from bullies and thieves. Michael moved from ITT to National Lead which would later become Elementis. There he prided himself as a self-taught chemist as he obtained patents associated with the use of Titanium Dioxide which he referred to as “the Pigment of Life” as it makes up all things paint. Michael retired from Elementis and completed his career as a successful legal consultant. Throughout his career Michael was responsible for 82 individual patents. Michael was loved by his family and friends and was known as the Emperor of Fun. Whether he was taking his children on forced marches through the woods or up mountains, jetting off to his tenth last trip to Vegas, enjoying upscale dining, fine wine and good cigars, or just sitting at his desk and counting his money, he was always kind hearted and generous. Michael had a great humor and loved to take contrarian positions in any argument where he always laughed and oh ho ho’d his victims. He enjoyed travelling to Maine, Dewey Beach, Delaware and returning to Germany as often as he could. Always with something to do, Michael was forever enjoying life. Michael is predeceased by his son, Ian Michael Cronin, and his sister, Regina Gill. He is survived by his beloved wife of 58 years, Barbara (nee: Hague), who misses him and needs him, and his loving children; Catherine and Chris Gardner, Raef and Cathy Cronin, Rachael Cronin, and Michelle and Rob Louden as well as his brother, Dr. Terry and Kathy Cronin. Also surviving are his grandchildren who knew him as Pepa: Jack, Devlin, Clayton and Harry Gardner; Aidan, Kieran and Corey Cronin; Finley and Bonney Donachie; and Shawn Louden. Additionally surviving are his brothers-in-law and their families: Rick Gill; Phil and Susan Hague; Chris and Gail Hague; and Jerry and Donna Hague, as well as his nieces and nephews and their children, many of whom knew him fondly as Uncle Buddy: Terry and Dee Dee Cronin; Colleen Alcott and Jeaneen McWilliams; Joseph and Jeffrey Hague; Christina Hague; and Stephen, Michael and David Hague. Dear God, if there is a god, please save Michael Cronin, protect him as the ever kind man he was, but please, please PLEASE God, DO NOT SAVE THE QUEEN! All arrangements are private and under the care of at the John E. Day Funeral Home 85 Riverside Avenue Red Bank, NJ 07701.